An oft-repeated argument from death penalty supporters is that state-sanctioned executions give loved ones of murder victims closure and justice for the tremendous loss they have suffered. Many pro-death penalty advocates see it as the ultimate form of retribution. One organization, Journey of Hope . . .From Violence to Healing, seeks to change this false narrative. Journey of Hope is an organization comprised of exonerees and murder victim family members. Sharing personal stories is one of the most persuasive ways to change hearts and minds about the death penalty. Last month I had the honor of spending several days in Houston, Texas with Journey of Hope for a leg of their annual speaking tour. I was able to attend several of the formal speaking presentations at various schools and parishes. I also had the chance to share living quarters and break bread with this dynamic and eclectic group of people. The aching sweetness and resilience of humanity was palpable in all of my conversations with Journey of Hope. One member, Derrick Jamison, spent twenty years on death row for a crime he wasn’t even present for before being exonerated in 2005. One wouldn’t blame Derrick if he were filled with bitterness after experiencing the egregious injustice of being on death row for a crime he did not commit, but he was nothing but sincere and full of grace in the short time I spent with him. 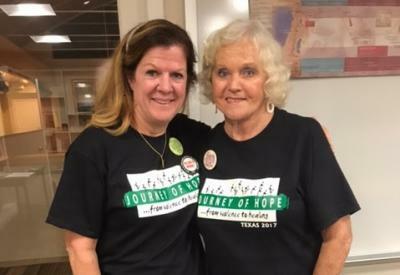 One of the most poignant and powerful stories I heard during my time with Journey of Hope was from one of the organization’s co-founders and CMN speaker, Marietta Jaeger-Lane. In 1973, Marietta’s young daughter Susie was kidnapped from a Montana camping site when she was seven years old. The whereabouts of Susie were unknown for one, agonizing year. The man who had taken and eventually murdered Susie was caught and arrested months after the kidnapping, in part thanks to Marietta’s ability to keep him on the phone when he called the Jaeger-Lanes’ home one night. When Marietta shares her story and relives the painful memories of not knowing where her daughter was, she does not deny the anger she felt. She credits her Catholic faith as instrumental when it came to finding the strength to overcome her understandable rage and forgive the man who took her daughter. Even in the depths of her pain and heartache, Marietta refused to advocate for her daughter’s murderer to get the death penalty, “In my case, my own daughter was such a gift of joy and sweetness and beauty, that to kill someone in her name would have been to violate and profane the goodness of her life; the idea is offensive and repulsive to me.” While facts and statistics help change minds, it’s personal stories like Marietta’s that have the power to change hearts and help people understand the true moral and societal consequences of how the death penalty causes harm rather than healing.